I would just like to apologize for two things right off the bat; first, for the very unoriginal title of this post; and second, the awful photographs I have posted. Unfortunately, it's already 10:30 pm and it has been a very long day. I'm doing the best I can with a low level of light and an even lower level of brain power. I did manage to complete Laura's sketch 18 and Rae's bonus sketch-- I had so much fun participating last week, I just had to give it another go. For Laura's sketch, I was planning to make a birthday card for someone special in my family. Unfortunately, I'm not quite sure how I will position the sentiment into the design of my card, I'm going to play around with it when I'm a bit more bright eyed. I was inspired by the vintage wallpaper feel of this Basicgrey paper. Even though this line was put out as their Christmas paper, I think the muted greens and reds work well for other occasions too. For Rae's bonus sketch, I made a card for my cousin who is expecting her first baby sometime in February. It's a very exciting time for her and I can't wait to meet her little fellow. My little guy is all geared up to be a big cousin. He's already planning on teaching him how to run around, jump on stuff, yell really loud, jump off stuff, you know all that good boy stuff. I just hope the two little ones will grow up to be great friends, just as my cousin and myself have. 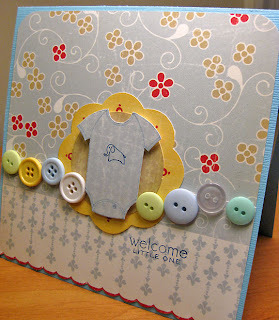 All the paper used for this card is from Cosmo Cricket and the stamp is from a set from Papertrey Ink. Well, this is really conquering two goals with one felt swoop. I've completed another card challenge and I now have two more cards (almost) ready to go for my loved ones. Great, now I can sleep soundly. wow! your cards are beautiful. i love the paper you used on the first one. gorgeous! Gorgeous work! 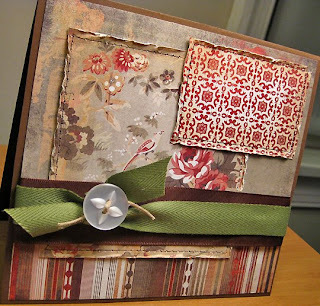 I agree with you on the versatility of BG's Wassail collection, it looks fabulous on your card based on Laura's sketch! And your card based on my sketch is absolutely darling! ~ I love the row of buttons ~ thanks for playing with it!! Both cards are wonderful - you do beautiful work! Loving the Wassail paper on a birthday card...it totally fits! Both cards are fabulous!! Great job with the sketches! Beautiful cards! The BG paper doesn't look Christmasy at all! Great takes on the sketches! um, WOW!! I love them both but that first card is jaw-dropping gorgeous! Beautiful work. fabulous take on both sketches! love them!! So different but both very beautiful. Wow, love them both!!! Gorgeous work!